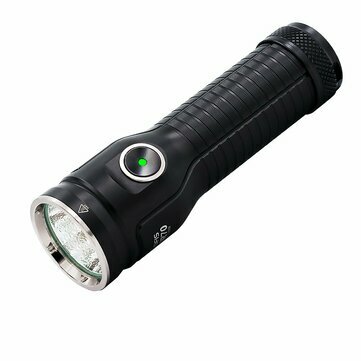 ● Uses a 26650 5500mAh high-rate discharge lithium battery,the main light and side light dual light source design. ● The main light utilizes XHP70.2 P2 CW LED,output up to 3500Lumens. ● One-touch control all function,it is easy to operate. ● Body with Micro-USB charging,which supports up to 2A charge. ● Can be used as a mobile power supply,use the USB adapter provide power to other devices,the maxmum output to 2.2A;with a dischargercapacity reminder. ● Users constant current circuit, with high battery effciency,stable output,no flashes. ● Anti-reverse design to prevent incorrect battery installation causes the circuit damage. ● Battery power detection,charging instruction,low battery reminder function. ● With locking function prevent accidental illumination. ● One-pieces shell,the structure is stable and reliable. ● Made of aero grade aluminum alloy,premium Type III hard-anodized anti-abrasive finish. ● With flashlight self-location function. ● Before charging,ensure that the battery is correctly loaded into the flashlight, and the tail of the flashlight has been tightened. ● Insert the charging cablle Micro USB port into the flashlight charging port,then insert the charging cable USB port into the power port to recharge.Charging light red indicates charging,green indicates charging has been completed.The flashlight can only turn on side medium mode while charging.